Expert roundups are the new guest posts: Everyone is doing them, mostly without much strategy behind them. And that’s unfortunate—the tactic is highly efficient when approached creatively. Engaging niche influencers to co-create content for you is a great way to create free content and get those influencers promote it for you. But don’t stop there. If you target long-term benefits, you’ll achieve so much more than just free content and free shares. 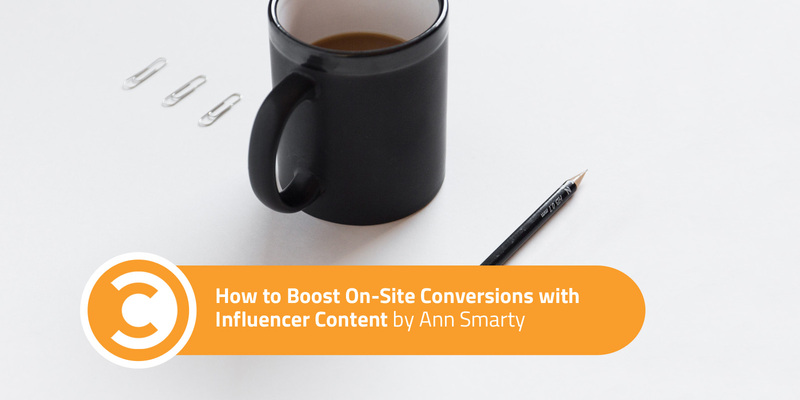 Stop doing what everyone else is doing: Here are a few ideas and examples for you to get your influencer-driven content marketing to a new level, allowing you to up your site conversions and achieve long-term marketing goals. The smartest thing to do is to engage those contributing influencers in the creation of a product you are selling or giving away to collect leads. 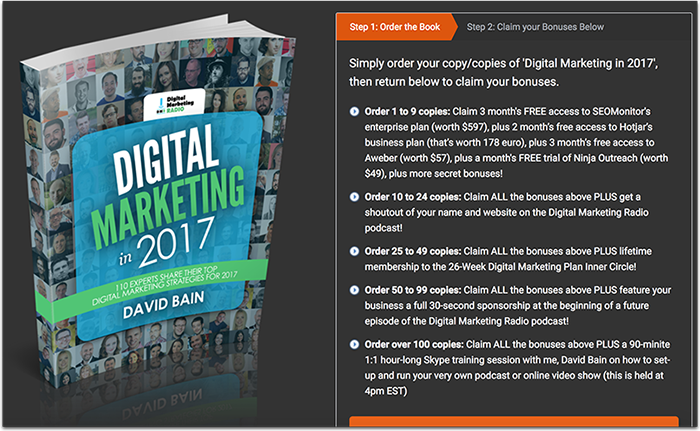 One of the best examples of this tactic is David Bain’s Digital Marketing in 2017 paperback book. David invited over 100 digital marketing experts to participate in his live show which was streamed on Facebook Live. Then he collected the tips and turned them into a book featuring all the participating experts and encouraged them to share the product. Following the event, David Bain’s podcast grew to 10,000 downloads per month, and he sold over 1,000 copies of the book—all thanks to the influential names featured in the book, as well as help from those experts. The tactic can be applied to evergreen content too. 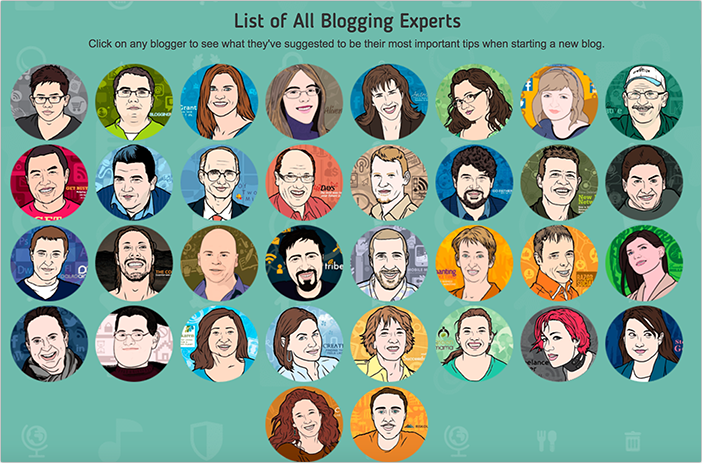 FirstSiteGuide interviewed blogging experts to feature them on their downloadable guide page to increase the trustworthiness and virality of their tutorial. The FirstSiteGuide team offer the PDF guide for free, making the influencers part of their primary lead magnet. Featured Tool: If you’re thinking about making influencers part of your product or lead magnet, start with brainstorming a topic which is both in high demand and interesting enough for more influencers to get on board. There are two things that make quotes an effective marketing tactic: People love being quoted, and people love sharing quotes. Furthermore, quotes make your site more trustworthy which ultimately leads to more conversions. Now, if you have gone through the trouble of contacting all those influencers and collecting all their answers, there’s no reason to stop there. It makes perfect sense to repurpose those valuable quotes on social media, in your other articles, and in other content assets outside of your blog (like Medium or guest contributions). Each time, there’s an opportunity to tag the contributing expert drawing them to your site again and again and encouraging them to help you promote your assets again and again. Plus, through influencers’ personal branding, visual quotes make your content more recognizable, encouraging readers to stop, read more, and subscribe. You can even turn your expert interview into a whole new visual asset and use it as a new piece of content (i.e., as a guest post on an authoritative blog). That’s what Shane Barker did. 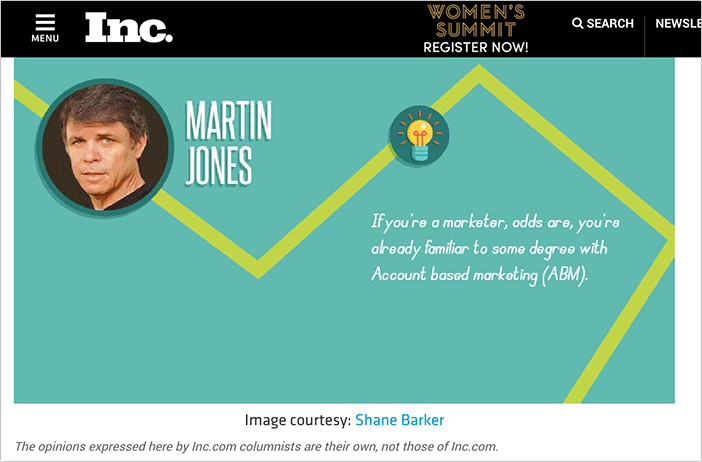 He turned his conversion optimization expert roundup into a “gifographic” and successfully pitched it to Inc.com with a nice link back to his blog. 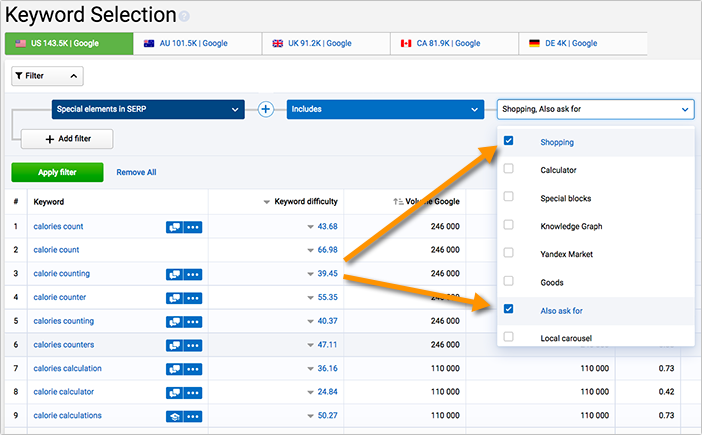 Important Notes: If you are planning to use expert quotes, you may run the risk of duplicate content. Editors hate receiving non-original content. You can use Shane’s tactic above, but don’t forget to use tools like PlagiarismCheck.org to make sure your expert roundup is 100 percent original. Furthermore, make sure your contributing experts know where you will use their quotes. You don’t want any misunderstandings with those powerful social media users. The greatest asset you earn from any expert roundup is the relationships you build with industry influencers. One collaborative piece of content is likely to increase your traffic and conversions (if done right), but it’s a one-time deal that will decrease in value once that article gets buried in your blog archives. On the other hand, having long-lasting relationships with industry influencers is priceless. Imagine running a highly engaged list of people with huge social media followings you can turn to again and again with new offers and updates. It’s a two-way street, of course, so in order to keep them engaged, you’ll need to be around to help them whenever they need you. Keep your contacts well organized. I use Salesmate to manage my connections on many levels. It tracks the history of how you acquired and verified all your contacts, including when and how you first contacted the influencer, what kind of a project you collaborated on, and what kind of a perk you used to entice them. Once you have developed your own relationship management system, consider developing those contacts into a micro-community of your own. This will allow you to keep in touch with those influencers on a regular basis instead of using your list to only pitch your ideas when you need help. 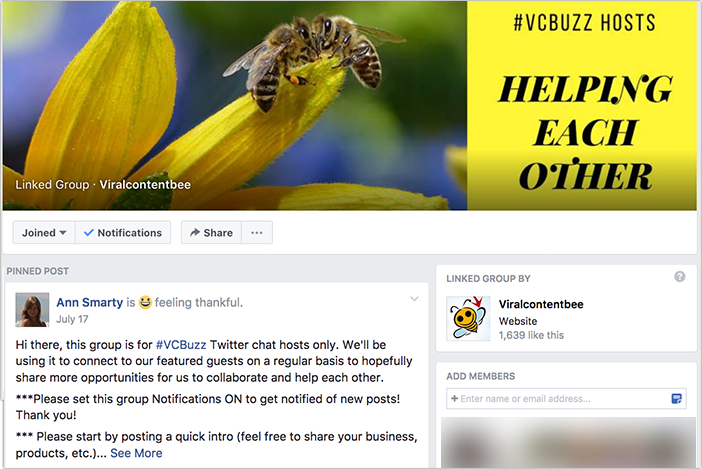 For example, at #VCBuzz Twitter chats, we interview a new marketing influencer each week and encourage each of our experts to join our private Facebook group, where we share chat calendars and answer their questions every day. To keep talking to your influential contacts, consider following a similar model using Facebook groups, Slack, or other community building platforms. Are you doing influencer-driven content marketing? Which tactics are you using to get more out of those efforts?